The NSW Police appear to have broken the law in arresting Craig Thomson today. And why did they need to strip search him? Managing editor David Donovan reports. AS TONY ABBOTT answered questions after his address to the National Press Club luncheon, seven NSW police* − not five as widely reported − arrived unannounced at Craig Thomson's electoral office to arrest him on 149* − that's right, 149 − charges — some of them as ghastly and improper as buying an ice cream on a HSU credit card. Strangely enough, it just so happened that the very News Ltd "journalist" most often embroiled in Liberal Party conspiracies, Steve Lewis, happened to be the MC at that very same Press Club event. This is the same Steve Lewis that wrote a story less than 24 hours ago announcing that charges were going to laid against Craig Thomson by the end of the week. What an amazing set of coincidences. The mood at the Press Club luncheon was strangely jittery. Abbott gave a typically empty robotic speech, devoid of any policy substance — yet the Press Gallery cheered him at the end like he had just delivered the Gettysburg Address. Could it be that most of this tight little polito-media clique were on edge, well aware something big was about to happen? 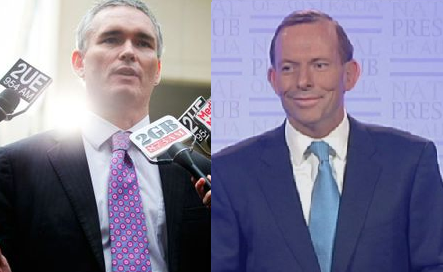 It sure looked like it, because when Lyndal Curtis told Abbott that Thomson had been arrested, Abbott barely blinked — he was utterly unsurprised. (On the other hand, he did blink quickly and repeatedly when holding his hand to his heart to declare no-one in his Government knew anything about the Ashby case.) Then he made a scripted sounding response — not the erratic, bumbling, word-stew he normally delivers when he's asked to think on his feet. Thomson had been arrested at precisely the right time for the Coalition — perfect to take media attention away from Abbott's dismal public speaking, that morning's leaked emails, and Gillard's election announcement; and all the media were perfectly arranged, set in the one place, ready to smear the Independent NSW MP at the slightest provocation — and through him, the Government. A coincidence? There is no such thing as a coincidence in politics. And certainly not on this scale. So, as Abbott spoke to the assembled press in Canberra, live on camera, seven police arrived to arrest Thomson (two remained in the car) as if he was a dangerous armed fugitive. They then took Thomson past the crocodilian hordes of journalists and cameras back to Wyong Police Station where they strip searched him — that's right, strip searched him (and you heard that first on Independent Australia) as if he was a common drug dealer. Beyond inflicting utter humiliation, why would they need to execute an intrusive strip search on Craig Thomson MP? A more cynical soul might suggest it was so they could advise this unspecified brothel witness about any private identifying features or birthmarks Thomson might have. Perhaps the NSW Police are best placed to explain this outrageous imposition on one of our elected representatives. Of course, police say Thomson could have avoided all this unpleasantness by "surrendering himself" to Victorian Police in December. The head of the NSW Fraud Squad, Detective Superintendent Col Dyson said that Mr Thomson was arrested on Thursday because he refused an invitation before Christmas to surrender himself. ''I believe that from reading the warrant he was invited to travel to Victoria to surrender himself prior to Christmas, he didn’t do that,'' Supt Dyson told reporters. Both Thomson and his lawyer forcefully deny that Victorian Police had ever asked him to surrender himself. According to them, Victorian Police lied on the warrant — they had never asked him to bring himself in to be arrested. Mr Thomson's lawyer, Chris McArdle slammed the process of the arrest and said his client would plead "not guilty" to all of the charges. Mr McArdle denied the NSW police account, saying Mr Thomson had only been invited to go to Victoria for an interview. The police need to explain this discrepancy regarding on the warrant. If the warrant makes incorrect claims, then does this make the warrant unlawful? Beyond this, it seem the police were so determined to get Thomson at just the right time — even if it meant breaching the Parliamentary Privileges Act 1987. That's the one that states in S14(1) that an MP can't be arrested 5 days before or after attending Parliament**. Parliament, of course, resumes on Tuesday. On a prima facie basis, it appears almost certain that the timing and manner of this arrest has been coordinated by politicians, police and members of the media to achieve a desired political outcome. Peter Wicks will provide more detail about these extremely troubling matters tomorrow. It should be recalled that the Leveson Inquiry, beyond looking at phone hacking by the media, looked at cosy links between the media, police and politicians — and the illegalities and improprieties that resulted therefrom. There has been an outcry amongst Australian media and conservative politicians that these sort of practices could never and would never happen in Australia. However, anyone who has been following IA's Jacksonville and Ashbygate investigations must have, at some time, developed grave apprehensions that not only could they happen but they do — and frequently. Indeed, the links between the Victorian Police and the Coalition warrant a judicial inquiry just in and of themselves. Craig Thomson may, for all we know, be guilty as charged. However, the manner and timing of his arrest is extremely disturbing and raises troubling questions about the links between the police, media and politicians of a certain stripe. This publication is deeply concerned about the health of our democracy. We think it is time for Australia told conduct a Leveson-style Inquiry to get to the bottom of this murky nepotistic mess. * UPDATE (31/1/13, 11:18pm): At time of writing, reports relied on by the author said Thomson was charged with 149 offences. Some newer reports tonight say he was charged with 150. Without seeing the charge sheet, which we have not yet been able to do, we have no way of verifying the exact number. In addition, it appears we may have incorrectly stated that seven NSW police attended Thomson's arrest; in fact, it seems some of the seven police may have also come from the Victorian force. ** UPDATE (1/2/13, 5:25pm): Despite the advice given to many members of the media, including Independent Australia, that this law was applicable, new advice suggests this act only applies to civil arrests and not criminal arrests.